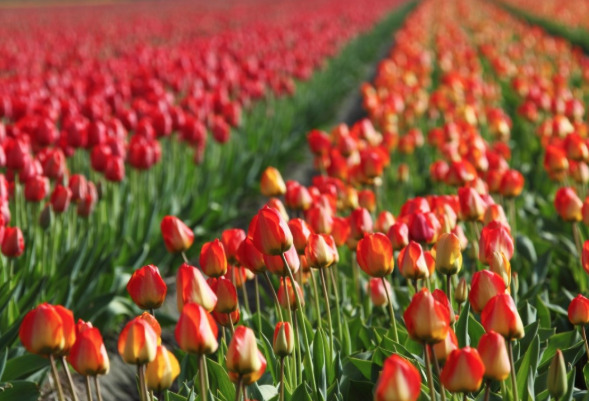 Dutch farmers have urged selfie-loving tourists not to trample upon their tulips. Bulb fields close to the Netherlands’ North Sea coast are a major tourist draw each spring as tulips, daffodils, hyacinths and other flowers bloom and transform the region into a patchwork of vibrant colours that provide the backdrop for many a holiday snap or Instagram post. The visitors, however, increasingly are walking into fields, damaging flowers and the bulbs so new signs have been erected urging tourists to enjoy the view but to stay out of the fields. While visiting tourists pour money into the region, the damage they do to plants also comes at a cost. If a tulip plant is trampled, the bulb it springs from will not grow sufficiently to be sold. A similar campaign last year was seen as a little too unfriendly so new signs have been made and farmer Simon Pennings said he plans to place “ambassadors” in fields to explain to tourists why they should stay out. One of the new banners, with the text Enjoy The Flowers, Respect Our Pride, was placed next to a field on Wednesday, but did not deter a visitor from walking into the field to snap a photo. Mr Pennings has seen it all before. “Bicycles, people, dogs, children, we see it all,” in the fields, he said. The Netherlands exports some three billion tulips each year, supporting a €15bn horticulture industry.